Summary: After upgrading a CMB16D 16 channel DC controller card from firmware version 1.30 to 1.33, unable to change the Unit ID. Description: I wanted to confirm which of my LOR cards would really work with high speed and enhanced protocol. Part of this test was to upgrade one of my CMB16D 16 channel DC controller cards from version 1.30 to 1.33. As noted in the release notes for 4.0.06 and 4.0.08, this upgrade should allow the CMB16D to operate both at high speed and using enhanced protocol. I moved the USB cable for my first LOR network from the show computer to the sequencing computer. I then opened the 4.00.28 hardware utility on the sequencing computer and easily upgraded the firmware to 1.33. After the upgrade, a refresh of connected devices showed that the CMB16D had upgraded to Ver. 1.33, however the Unit ID was now 01. Selecting that unit, I confirmed that I could control it using the hardware utility. 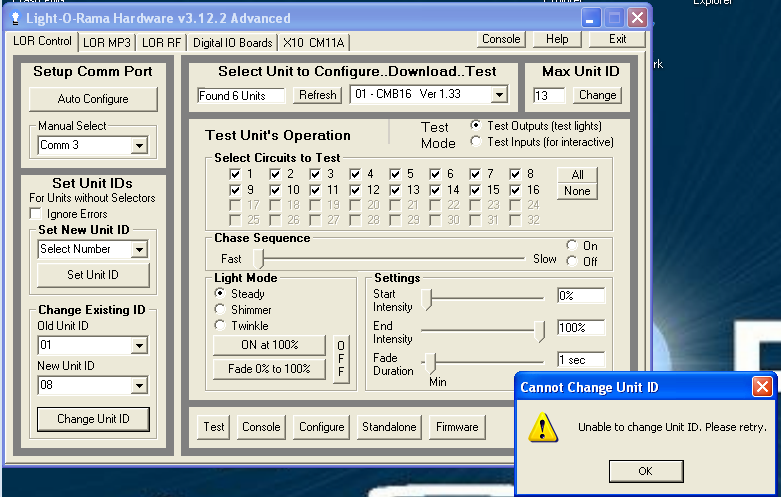 I then attempted to change the Unit ID from 01 back to 08 using the Change Unit ID in the hardware utility. It told me that it was unable to change the ID. Then remembering that CMB16D cards have hardware switches for setting the Unit ID, I realized that a power cycle should read the switches, and change the Unit ID back to what the switches were set for (unit 08). After powering the card and then back up it was still Unit ID 01 and again, the hardware utility could not change it. Over this process, this was repeated several times. The Starting Load and Grabbing Unit were there for about 15 minutes before I aborted. There used to be a Unit ID 01, but when my rose lights were converted to RGB, those lights became E1.31. That old card is a spare that I could swap in before my landscape lights come on in about five hours. Also in case you are wondering why this is unit 08 and not the next number which would be 07. There is a second CTB16D that is Unit ID 07, but it is only used for Christmas so it's powered down right now. My last step before swapping out the card is to take the laptop (Windows Vista and LOR 4.00.28) out to the front yard and plug it in stand alone to that one unit and see if I can change the Unit ID. Yes, please try the direct connection with nothing else connected. Try BOTH unit ID 01 to 08 AND Any Unit to 08 (why we want nothing else connected). See if either/both of those work or not. Once i have that info, I'll let the firmware guy know he has an issue. I had time to do a quick test before my evening light show starts on one of the CMB16D boards with version 1.30 firmware. This as a comparison to the version 1.33, worked exactly as I would have expected. Started unit 09 twinkling and walked outside for a look. Sure enough, my porch steps were twinkling. Then cycled power to the CMB16D that I had changed in software to unit 09 (but the switches on the board were still set for 08). Refreshed the network and it was back to unit 08. This is what I expected since the hardware switches on every LOR board that I have (that has switches), the switches take priority over a software setting when the board is powered up. I will still see what I can do with the board that had been updated to 1.33. However I wanted to make the above test to set the baseline and had to do that before my evening show starts - which will be sometime in the next few minutes. However, based on the baseline test with Ver. 1.30 boards, I see two (related) issues with version 1.33. I could not change the Unit ID using the hardware utility, and the hardware switches were not being read at powerup (or it was ignored). The inability to downgrade the firmware is still to be confirmed with it being the only card on the cable. OK, here is the results from off-line testing. Using my sequencing computer (Windows 7 and LOR 4.00.28), with a high speed USB-RS485 adapter, and a 1 foot Cat-5 cable to the one CMB16D controller with the hardware unit ID switches set for 08. I started the hardware utility and read the CMB16D that I had originally upgraded to version 1.33 firmware. The HU showed that it was unit 01 with firmware version 1.33. I first attempted to change the Unit ID from 01 to 08. The HU reported unable to change the ID as was the case before. I then tried to change the Unit ID for any connected ID to 08. Again, the HU reported unable to change the Unit ID. The next step was to attempt the firmware version downgrade back to 1.30. I first tried the downgrade specifying that it should attempt the firmware download to the selected unit. Just like before, I got the "Starting Load" and "Grabbing Unit" status indications, but no further. Since I had the controller in front of me, I could see that the red LED was flashing a short, long, short, long patten. I cancelled the download and did a network refresh to make sure the card was still visible - it was with no changes. I then tried again with the box checked to download to any attached unit. This time the firmware download worked perfectly. After this time, I did a refresh network and the card showed as unit 08, but unknown device. I power cycled the card and again did a refresh, and this time it correctly showed an ID of 08 and a CMB16 with version 1.30 firmware. As a last test, I attempted to change the ID using the HU from 08 to 09. The HU reported that the change was successful. Doing a network refresh confirmed that the CMB16D had changed ID from 08 to 09. I then power cycled the CMB16D, and did a network refresh again. The ID had changed back to 08 to match the hardware switches on the card. Summary is that Version 1.30 worked as expected and version 1.33 would not allow changing the ID either with hardware switches or with the Hardware Utility. 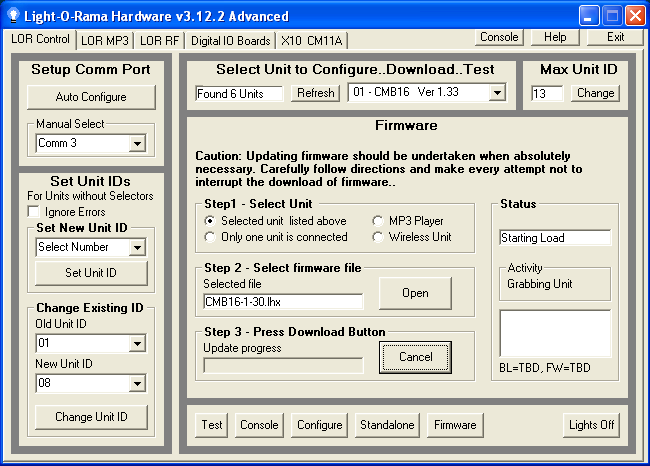 Furthermore, version 1.33 would not allow a new firmware download except when using the option for only one connected device (whereas the version 1.30 firmware allowed a firmware download with other connected devices using the download to selected device option). As I have all the pieces and parts on my desk for doing firmware updates either with only one unit connected, or with others on the cable, I can easily test any updates if needed. Excellent. Thanks for all of that! I'm not the firmware person, but what you are describing is certainly consistent with a UID problem with the firmware (including not being able to downgrade the firmware). I will get the info to them. Any followup on this issue? I would like to finalize my networking layout and need to be able to determine which controllers will not be able to use 500K speed and enhanced protocol. I know that my older 16 & 8 channels AC controllers can't be upgraded, but I need to know about my CMB16Ds fairly soon. Sorry. I have heard nothing since sending it over to them - well actually HIM. I'm sure it is on the list. I have a new firmware for you if you want to test it. Please eMail me mike at lightorama, and I'll send it to you. THANKS! Mike, I received the updated firmware and have done some testing. I started with my spare controller using my sequencing computer (Windows 7 and S4.00.32). The spare card started out as version 1.30. Just to make sure of my hookup, I did the first couple only to make sure everything was working. The switches on the CMB16D were set for Unit ID 08. Any Unit ID changes were confirmed by performing a network refresh in the HU. 1) Version 1.30 Changed unit 08 to 07 using HU - OK.
2) Version 1.30 Changed any unit to 08 using HU - OK.
3) Updated firmware of any attached controller to 1.34 - OK. Unit ID remained 08. 4) Version 1.34 Changed unit 08 to 07 using HU - Failed. 5) Version 1.34 Changed any unit to 07 using HU - Failed. 6) Version 1.34 Changed switches to 07. HU refresh showed CMB16D changed to 07. 7) Version 1.34 Changed switches to 08. HU refresh showed CMB16D changed to 08. At this point with about 10 minutes before my evening show was scheduled to start, I switched to the show PC (Windows XP withS4.00.32) and disabled shows and started the hardware utility. There are 6 controllers on the show network. There is a list in the top of post #4 of this thread. I did all my testing on this network with a CMB16D that has the hardware unit ID switches set to 08. 8) Version 1.30 Changed unit 08 to 07 using HU - OK.
9) Version 1.30 Changed unit 07 to 08 using HU - OK.
11) Version 1.34 Changed unit 08 to 07 using HU - Failed. 12) Using the HU on the show computer, I controlled individual channels and groups of channels on the upgraded CMB16D and it worked exactly as expected. As this is my production environment I was unable to do any further tests. However I shut down the HU and Enabled the show schedule. I then walked outside and blocked the remaining light to the light sensor that triggers the show causing the show to start. The show started normally. I then triggered one of the interactive groups that would change the lights controlled by the CMB16D that I had just updated to version 1.34 and the lights did exactly what they were supposed to do. I came back inside and resumed testing on the spare controller using the sequencing computer. 14) Version 1.30 Changed unit 08 to 04 using HU - OK.
15) Version 1.30 Power cycled the CMB16D - Refresh showed ID changed back to 08 to match the switches. 16) Version 1.30 Changed unit 08 to 05 using HU - OK.
17) Version 1.30 Changed any unit to 07 using HU - OK.
18) Version 1.30 Power cycled the CMB16D - Rescan showed ID changed back to 08 to match the switches. 19) Selected CMB16D with Unit ID 08 and downloaded firmware version 1.34. OK - Unit ID remained 08. 20) Version 1.34 Changed any unit to 07 using HU - Failed. 21) Version 1.34 Changed unit 08 to 07 using HU - Failed. 22) Version 1.34 Changed switches to 06. HU refresh showed CMB16D changed to 06. 23) Version 1.34 Changed switches to 08. HU refresh showed CMB16D changed to 08. Unable to change Unit ID. Please retry. That error was previously shown in post #1 of this thread. In all cases, when performing a network refresh, the HU would correctly identify the CMB16D unit ID. If I did the refresh immediately after power cycling the CMB16D, the controller type would show as Unknown, however a second refresh would show it as a CMB16D with the correct firmware version. Summary: A CMB16D with firmware version 1.34 will always read the hardware unit ID switches. Attempts to change the Unit ID via the HU always failed. A controller connected to lights would properly control the lights both with the HU and the Show Player. All tests were made using S4.00.32. Once the evening show started, the Show Player properly controlled lights using sequences that were created in S3.12.2 using NON-enhanced protocol. So far, no testing has been done using enhanced protocol. I expect to do so Friday evening or over the weekend. Anything else you would like me to test, please feel free to do so. "Summary: A CMB16D with firmware version 1.34 will always read the hardware unit ID switches. Attempts to change the Unit ID via the HU always failed..... "
That is expected with version 1.34 of the firmware..... 1.33 was broken as the logic reading the switches always set the Unit ID to 01... Just a little more information: Earlier versions of the firmware acted differently. With the earlier versions you could change the Unit ID with the HWU but that change was only temporary. When you re-powered the CMB16, the Unit ID would revert back to the original ID (that could be confusing)... In addition with the older versions of the firmware, when you changed the Unit ID switches you had to re-power the unit to pick up the changes. Now it reads the Unit ID switches all the time and picks up the change in the Unit ID immediately. The reason for the change has to do with a change in standalone mode... With version 1.34 of the firmware, you can now adjust the speed of the sequence playing by adjusting the Unit ID switches. If you set the Unit ID to "F" "?" ("F" followed by any value) then the Unit ID is set to "0" "1" regardless of the setting of the Unit ID switches. The second value adjusts the speed of the standalone sequence. So to adjust that speed, the CMB16D is now constantly reading the Unit ID switches rather than only reading them once when it started up. Thanks for the more detailed answer. Sounds like Ver. 1.34 is now working as intended. I will test the 500K speed and enhanced protocol tonight. I will also plan on updating the rest of my CMB16Ds to 1.34 sometime over the weekend.